The 21st Amendment to the Constitution became effective 85 years ago today, ending National Prohibition. It also set in place the outline of the system of alcohol regulation that is still with us today. 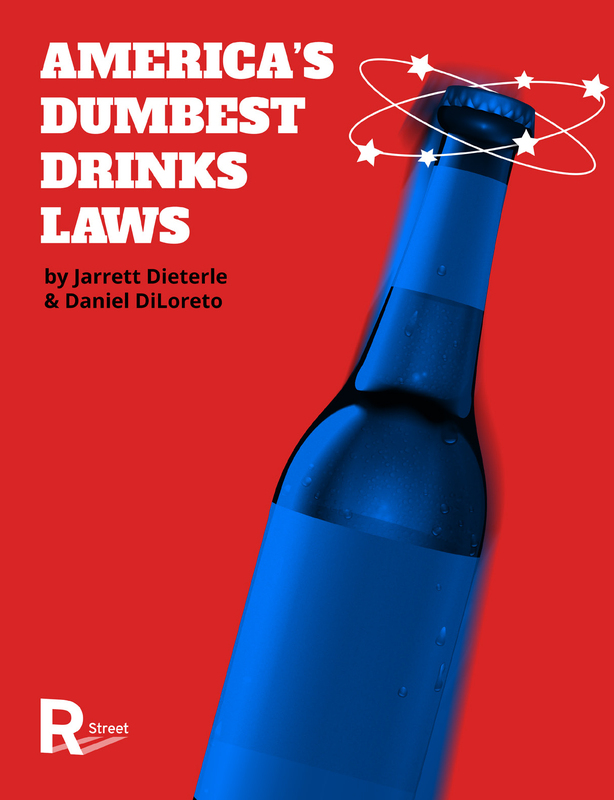 In what may be the longest hangover in history, many vestiges of Prohibition remain in America's alcohol regulation system and they haven't aged well. Conveniently, the R Street Institute has published a booklet detailing some of the more absurd laws that remain on the books. Most were passed in the immediate aftermath of Repeal and have not been much examined since. 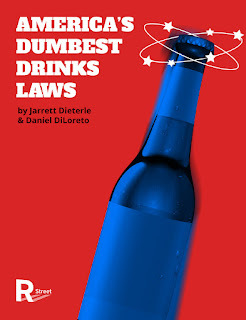 'America's Dumbest Drinks Laws' was released today, in honor of Repeal Day. You can download the PDF here. 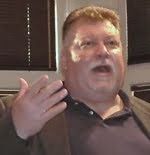 The R Street Institute is a nonproft, nonpartisan, public-policy research organization (“think tank”). Their mission is to engage in policy research and outreach to promote free markets and limited, effective government. As the booklet notes in its introduction, "although the 21st amendment repealed Prohibition, it still allowed state and local governments broad control over hooch." My favorite dumb liquor law has always been Indiana's ban on cold beer (#3). Specifically, although Indiana law allows beer to be sold in drug stores, supermarkets and convenience stores, only liquor stores may sell beer cold. Efforts have been made to change this law but the liquor store lobby has managed to block it. The pain of this prohibition was lessened somewhat earlier this year when Indiana allowed liquor stores to operate on Sunday. At least it is now possible to buy cold beer seven days a week. One dumb law I did not know about is the federal prohibition against distilleries on Native American lands, which has been in force since 1834. As authors Jarrett Dieterle and Daniel DiLoreto note, "While many of the laws on this list deserve our ire, this one stands alone for its general odiousness in treating people differently based on nothing more than their heritage and race." As states rush to end the prohibition on marijuana, this might also be a good time to finish the work of December 5, 1933 and bring some common sense to the regulation of alcohol. Common sense and the government; haha, that's a good one. How about Indiana's law prohibiting minors from liquor stores? I can buy all the booze I want, with my kids in tow, at the grocery store, but how dare my kids accompany me to the local liquor store. That law needs to go the way of the dodo.